Ahhh, the Blue Martini Lounge's Signature Specialty. This little number was created by David as a way to tone down the taste of a gin martini. 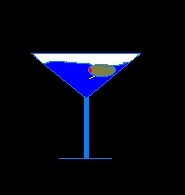 The Blue Martini can be ordered in a gin or vodka based version, and each does come with an olive, pimento included. In this signature concoction, only premium liquors are used. For the gin based version, David decided on 2 oz of Bombay Blue Sapphire gin, 1 oz of blue curacao, and a dash of dry vermouth. For the vodka Blue Martini, David decided that the blue bottled SKYY vodka should be used, simply replacing the Blue Sapphire with it. Enjoy the taste of the Blue Martini, and remember, drink responsibly. DON'T drink and drive. Go back to the bar.